All birds of prey have strong, curved beaks with sharp edges. They use their beaks like we might use a knife and fork: to cut their food, to eat, and to feed their young. Though raptor beaks all share certain characteristics, there is some variation in beak size, shape, and function among different species. A bird of prey, like all animals, needs food to survive. As it is developing in the egg, it is already forming the tools it will need to make a living as a hunter. But before a raptor takes its first bite of food, it uses its beak for another very important thing: to break out of its egg! This is tougher than it looks, so thankfully birds of prey have a special tool to help. 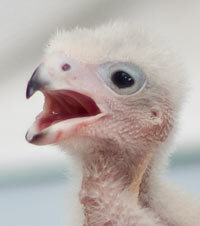 At hatching, they are equipped with an egg tooth – a pointy knob on the top of their beaks. They use this egg tooth to make the first crack or hole in the eggshell. After that initial break, they use the egg tooth to continue tapping their way out, a process that can sometimes take up to three days. A short time after hatching, the egg tooth disappears. As they grow older, their beaks become stronger and stronger, eventually strong enough to tear meat. Until then, they use their beaks to beg for food. Holding their beaks open and making a chirping sound lets their parents know they are hungry! 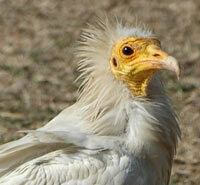 Egyptian Vultures use rocks and their beak to eat eggs. While all birds of prey use their beaks to eat, falcons may also use their beaks to kill their prey, though they still catch their food with their feet. Falcon beaks are equipped with a tomial tooth, a sharp triangular-shaped ridge on the outer edges of the upper mandible. They use this to kill prey quickly by biting their necks and severing the vertebrae. Other raptors need a bit more than just their beaks and feet to help them get the food they need. The Bearded Vulture feeds primarily on bones of medium to large animals. Though its beak is strong, it is not strong enough to break into the bones, which make up about 80% of this vulture’s diet. To solve this dilemma, the Bearded Vulture carries the bones high up into the sky, then drops them onto rocks far below, until the bones break into pieces small enough for the vulture to swallow. Another vulture, the Egyptian Vulture, has evolved a different method to feed on one of its favorite foods: ostrich eggs. This tool-using raptor first breaks the eggshell with a rock, then uses its beak to do the rest. Like birds of prey themselves, beaks come in all shapes and sizes. As you can imagine, big birds tend to have bigger beaks and small birds smaller beaks, but there is more to it than that. Before we go into detail about the differences between beaks, let’s think about all the types of bird beaks there are and why they are all so different. Herons, which are not birds of prey, eat fish and frogs among many other things. They have long pointed beaks like a sword that they use to spear their prey. Parrots, also not raptors, have extra strong beaks designed for cracking hard nuts and seeds. And hummingbirds, most definitely not birds of prey, have elongated, narrow bills to accommodate their long tongues as they probe flowers for nectar. Quite clearly, what a bird eats has a big influence on the shape and size of its beak, and the type of beak a bird has determines, in part, what it can eat. Birds of prey are no different. The Mauritius Kestrel has a short, stout beak for eating small prey like lizards, insects, and small birds. The Harpy Eagle, on the other hand, has a large, strong bill that it uses to tear into the thick hides of sloths and monkeys. Snail Kites, as their name implies, mainly eat snails, though they have been known to occasionally feed on crabs and turtles. To reach the juicy meat inside the curved snail shells, Snail Kites need an extra long and narrow downward curving beak, which looks like an old-fashioned can opener. Even though Snail Kites can be found in Panama where Harpy Eagles also live, and even though they are both raptors, you can see that they hunt very different prey. A Snail Kite's beak makes it difficult for the bird to feed on a monkey. 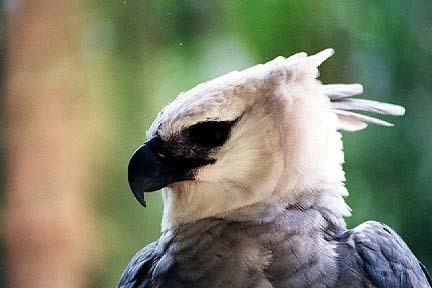 With its large feet and beak, a Harpy Eagle would be hard pressed to catch a snail. Next time you see a raptor, pay close attention. Looking at the size and shape of its beak will give you clues about what it eats!